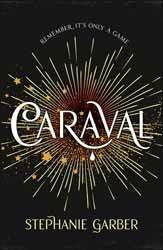 Caraval is a new fantasy book, written by Stephenie Garber. The story follows Scarlett and Tella. Having been sent a personal invitation to that year's Caraval, the sister are aided by Julian, a sailor acquaintance of Tella’s who helps them escape their father and travel to Caraval. Caraval is the central game of the book, a game which supposedly contains magic and whose prize, a single wish, brings the great and the good to play. If I had to explain it is very much like a role-playing game where nobody is what they seem. As well as the players, the game contains many actors who may help or hinder the player, the problem is that there is no way of knowing if characters are players or actors. The game consists of a set of puzzles which must be solved before the player can progress. On arriving at Caraval, Scarlett is separated from her sister, with a strong suspicion that she is being held by legend, who means both sisters harm. Together with Julian she must solve the problems set by the game to rescue Tella. We follow the plot through Scarlet's eyes, which is a nice device as we not only share her suspicions about Julian, whether he can be trusted or whether he is Legend playing with her, as well as experiencing her growing emotional attraction to him. There is also a sense of urgency as the game only takes place at night over a few days, so if Scarlet cannot solve the game there is a likelihood that she will never see her sister again. Within the game players can die, either temporarily or permanently, some even lose their minds leaving the game insane. There is some magic in the game, such as the negation of death, enchanted clothes and certain artefacts which can affect reality, but this is an almost inconsequential use of magic and is only introduced when it is needed to further the plot. Initially, I did not think that I was going to enjoy the book, unfairly classing it as fare for teenage girls. The first few chapters with the evil father, the chance of escape via marriage with a mysterious strange and the focus on the sister’s emotional bond did not bode well. However, get past the first few chapters and Garber has created a darkly grotesque world in which to stage Scarlet's desperate search for her sister. The book does have some deficits. The overall world is lacking in description and, apart for some vague feeling that we are in some form of renaissance Venice, the author remains unfocussed about both the world and its social structure. Caraval fares better, though this is given as almost dreamlike quality. As a character Scarlet start off weak, her continued allusion to everything being associated with a colour is overused, but thankfully much of this prosaic prose falls by the wayside once the game begins.